I fulfilled my goal of finishing my revision of The Jane Austen Project — a crucial reason for my silence here. That was back in September, or maybe October, depending on how one defines “finish” and “revision,” but now it is, it is, it is. No longer mine entirely, I am in the process of letting go of it. Nobody explains, in books that tell you how to write a novel, what a problem that really is. And I can’t help wondering, as I reread Anna Karenina once again, did Tolstoy have this problem? Rereading it again, I am less enthralled this time — why? The things I remember liking I still like. His amazing ability to move seamlessly through so many points of view and be convincing and sympathetic in each: Not just Levin and Kitty and Anna and Vronsky, but Dolly, Stiva and Levin’s dog, Laska. The cuckholded Karenin. The authority with which he writes of country and city. Yet this time I am conscious of reading in translation, as if watching a scene through gauzy fabric. These are not the words he chose, but approximations; those real words are off limits to me. This must have something to do with the way how I read has changed since I started seriously trying to write fiction. I see his little tricks more clearly now. How obvious that Vronsky’s disastrous horse race, where he lands wrong and breaks his mare’s back, is simply echo and foreshadow of what he has done and will do to Anna. Why? The way the episode doesn’t affect anything else, plotwise, in Vronsky’s life. We did not know before that he liked to race horses; as best I can remember it never comes up again. It feels like a set piece, a Symbolic Moment. True, Anna’s reaction to Vronsky’s mishap is important to the plot: It’s when her husband can no longer pretend he doesn’t see what’s going on, causing him to confront her. But this could have happened any number of ways; the horse race was optional. The way Tolstoy tells the story of Anna’s journey to and from Moscow by train: The foreshadowing now seems leaden-footed, almost hilariously so. But maybe that is just me. And I found myself wondering something else. Everyone wants to retell Pride and Prejudice, update Jane Austen to modern dress. But what if you tried that on Anna Karenina? 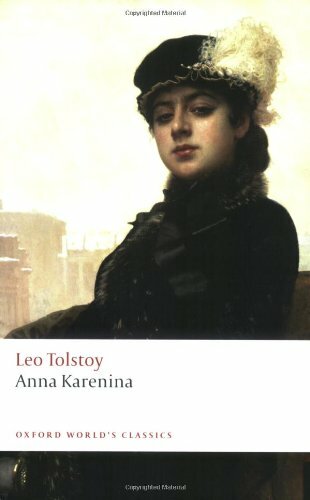 What are the essential features of Anna Karenina, and what is merely 19th-century Russian window dressing? Lots of duality in AK. Two cities, two marriages, two ways of seeing the world. Europe vs. Russia. Country vs. city. Peasant vs. aristocracy. A modern-day Anna Karenina would have to be set in America, I think. (India would probably work too, but I don’t know India well enough to know where to start.) You need two cities, first of all, representing opposing values. At first I assumed it has to be Washington and New York, respectively seats of government and finance, so the characters can easily travel back and forth by train and later jump under one. But would New York and LA actually be better? Or even Washington and LA? For next we get to the problem of what these people will do. What are the equivalent of Russian aristocrats in early 21st-century America? I like the notion of Vronsky being in the film industry in some capacity, a handsome, shallow, gluten-free New Ager with a rigorous exercise routine. Levin, perhaps, is a hipster farmer from some old-money New England family, raising grass-fed beef and free-range chickens on his farm in the Berkshires now that he’s wearied of the scene in Brooklyn. Gloomy, self-righteous, but finally with his heart in the right place. The Shcherbatsky family I imagine as wealthy German Jews, longtime pillars of New York society, present at every glittering fund-raiser, their name on lots of buildings. Karenin is something important in government: Fed chairman, maybe, or a cabinet secretary. And Anna? Simply a society wife? One crucial problem with any Anna Karenina update is how the world that women live in has changed so utterly in the past 125 years. It’s hard for her adultery to be so shocking. Unless Vronsky were maybe 16 or 17 and a student at the fancy D.C. day school where she volunteers… because her own son also attends? Yes, that could shock, even today. Kitty would need to be a student there also, which would explain how she had a thing for Vronsky — and why Levin’s love for her now needs a little more unpacking. But, no, why is she in Washington, since her family lives in New York? No, she has to have met Vronsky somewhere else: a semester abroad in France. Trekking in the Dolomites. Kitty’s complaint after Vronsky dumps her is not incipient TB but anorexia, and prescription drugs figure prominently in Anna’s breakdown. The central, remarkable message of Anna Karenina — that women always pay for the sins of men — must somehow survive, however filtered through our own age’s conventional wisdoms.